2018 note: Jupiter is trine natal Pallas, as is visible in the chart. I wrote the original post below before making the connection between scandals and Jupiter-to-Pallas transits. 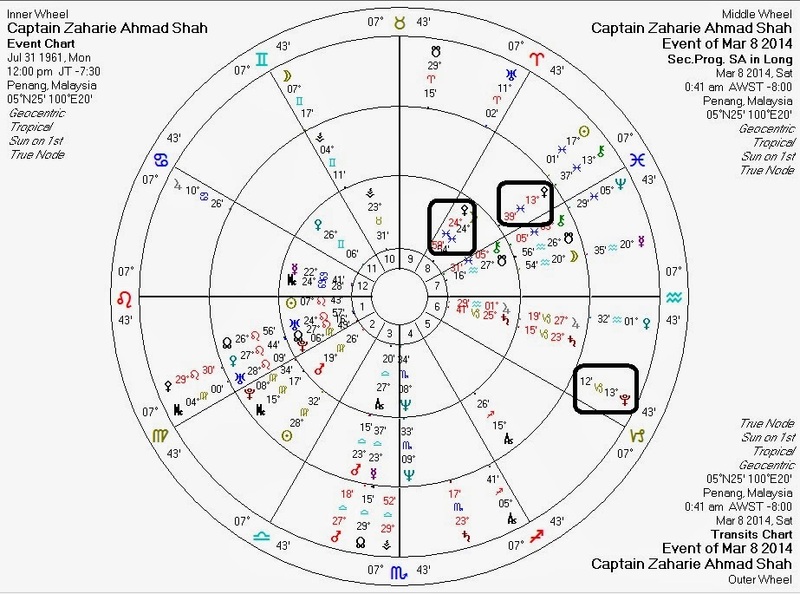 This is a chart with transits and progressions against a chart for Captain Zaharie Ahmad Shah, the pilot of the mysteriously missing Malaysia Airlines Flight 370. No time or location of birth is available: here the location is set as Penang because he reportedly entered Penang Free School in 1974. In any event, birth location is irrelevant for this consideration. The chart shows that transiting Pluto would have formed aspects against both his natal Pallas (a quintile) and his progressed Pallas (sextile). Pluto-to-Pallas transits trigger an ethical crisis: a period of time in which the native is likely to face a crisis of decision-making either in the form of an ethically challenging situation and/or temporarily poor impulse control. While proving nothing, the chart suggests that during the flight the captain may have been capable of actions which are notable for ethics or lack thereof, and/or of behavior that is not consistent with his normal ethical structure. US President Barack Obama is under the same transits: for him most likely relating to the recent fallout from his administration's meddling in Ukraine. While this is (probably) not a political event, it illustrates the importance of Pallas which is the central astrological element for this blog. Pallas rules ethics in the horoscope and is the single astrological indicator for libertarian-to-authoritarian social philosophy. Birth data for Zaharie Ahmad Shah is from Lynn Koiner via the NCGR newsletter.